The final stage of the authorization flow of sell leave requests is the processing of the request by the administrator. 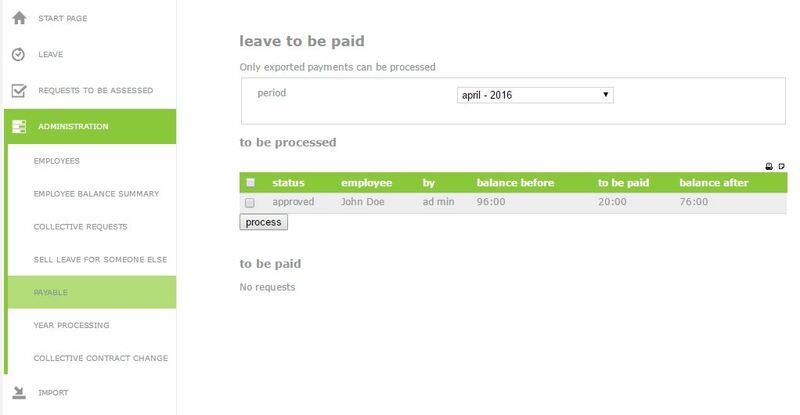 In ‘administration’ | ‘payable’, an overview of all the sell leave requests with an ‘approved’ status will be shown. In 3 steps, the administrator can process the request (for the salary administration) and finish the process. Select the request in question, and select the print icon or the export icon in the top right-hand corner. The selected request will then either be printed or exported to an Excel Sheet with the necessary data. This way, a physical or digital document of the request will remain, which can be sent to the salary administration for the payment. Select the exported request again and select ‘process’. The request is then processed in the system, and is ready to be paid. Attention! This step is only possible when the request has the ‘exported’ status (see step 1). This is a control phase. At this time, contact the salary administration. When you are certain that the employee has been paid, the process can be finished. To also note in the system that the request has definitely been paid, select the request and select ‘paid’. This is specifically for administrative purposes. The request that was to be paid has now been finished and the leave has been sold.